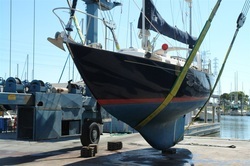 Hauled out as part of the marine survey. The pictures below show the issues that the survey confirmed and some uncovered that we had not seen clearly before. The final 'to do' list runs to over 100 points but the essential repairs (structural and safety related) was only a handful of items. 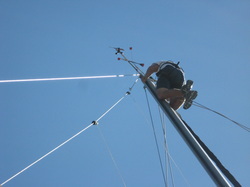 Lou Stahlberg doesn't go up the mast. We had a survey done by Stix and Rigging. The standing rigging is less than 10 years old so not really an issue but good to have a bill of health for this part as well. 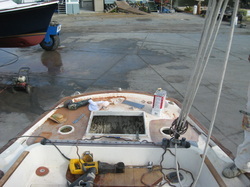 Running rigging needs to be replaced as most has mildew and is green and wet. We had seen that already and some of the other key issues (chainplates covered by Lou and the boom/sheet fitting by myself) weren't spotted by S&R. I wouldn't spend that money again. 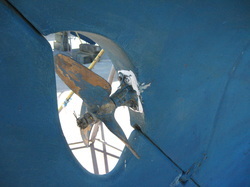 The bow fitting (aluminum) was corroded from below. 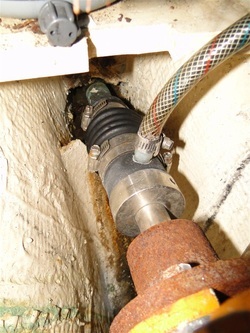 The pressure created by this pushed the fitting up to the point of breaking it on both sides. The chocks were broken as well. Aluminum is difficult to weld. But these fittings are even more difficult to find and casting a new one would be costly. The chocks didn't survive but we found new ones on EBay. 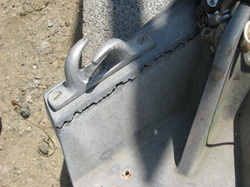 Another major issue were the chain plates. 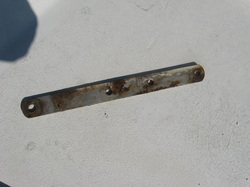 We found one with haircracks and therefor decided to pull all chainplates and renew these. 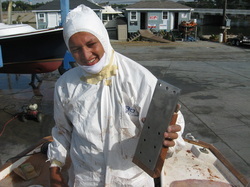 A yawl has a lot of chain plates! This was worse than we thought and did cost more work than hoped for. 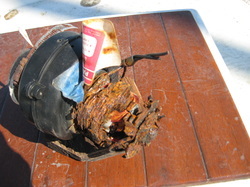 The aft deck obviously had some wet spots but when we started taking things apart it was obvious that the whole aft part needed to be reconstructed. 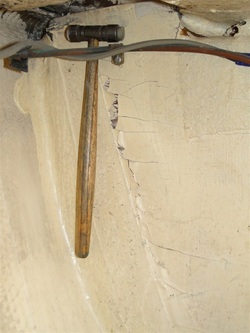 The tension of the stays, the numerous perforations for chainplates, cleats, mast and cables caused complete delamination and rotted the balsa core. This is the new chainplate and backing block for the mizzen stays. The only solution for these plates was completely glassing in. The others we left in sight and unpainted/uncovered to avoid corrosion. 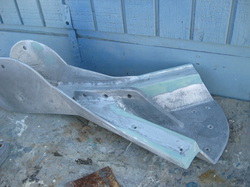 Some of the bulkhead tabbing had become undone and was repaired. 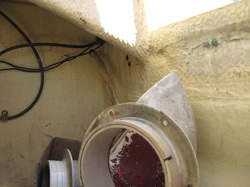 Other issues were some loose electrical wires and the use of screwnuts that are bad practice in wet environments.